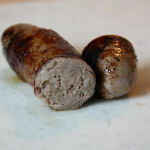 These sausages from Churchgate are styled on a traditional Greek loukaniko. Yes Ok agreed there are a few variances in the ingredients used, such as lemon zest replacing orange, but hey these sausages are Jason Drage's own take on the recipe! 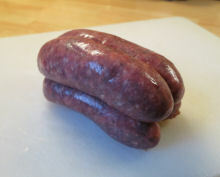 We've tried and enjoyed many sausages from the Churchgate Sausage Company and these are as usual exceptionally well made and presented. 80% meat (60:40 lamb to pork) with some lovely fresh flavourings in very good quality skins as you would expect. Cooked up they brown really well and the medium / course texture of the meat makes for a good firm bite. Let's not muck about though, they are meaty and strongly flavoured with the fennel and garlic really bouncing through, which unfortunately didn't go down so well with some of the troops here. Perhaps a bit too meaty and herby was the comment which I feel was somewhat harsh as I liked them, and so did the Number 1 daughter who's a self-confessed "foodie"! The 60:40 meat ratio certainly gave the sausage more of an open texture, as solely lamb would no doubt have made for a very solid texture when cooked. We'll definitely get some more and try them properly Greek style in a spetzofai. A very simple, rustic Greek dish of loukaniko, bell peppers, tomatoes, red wine and onions. Jason Drage of the Churchgate Sausage Company really knows his stuff. You really should try the LOUKANIKO and make your own mind up. 120x30mm before cooking, 110x28mm after. 85g before cooking, 66g after. That's a shrinkage of 14% & weight loss of approx 22%.